The water level has started to drop a little but the water temps are not moving in the right direction. This past several days my clients have caught some huge gills, nice crappies, a bunch of jumbo perch and a good mess of walleye. Haven't had a great stretch of weather to work with but overall the fishing is going pretty well. Musky action is starting to pick up but for the most part we still need to get some warmer temps to really kick the bite into high gear. I helped a guy land a nice 47.25" a couple days ago...great story to ask about if you are in the boat this year. 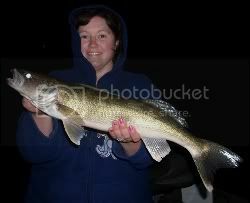 Here is a picture of one of the better walleye of the week.